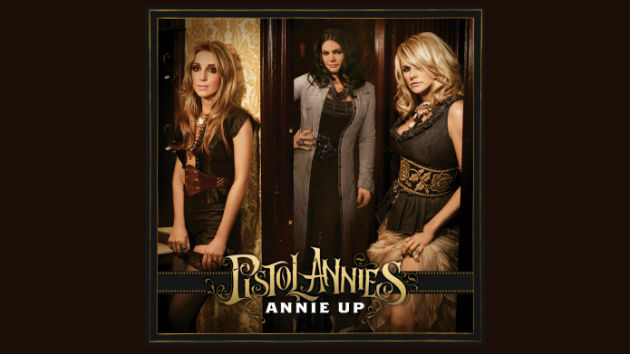 Perhaps the most important trait of this sophomore album by the Pistol Annies is that a major Nashville label is prepared to back a project that is drenched in a traditional sound and wraps it heart right round the roots of country music. 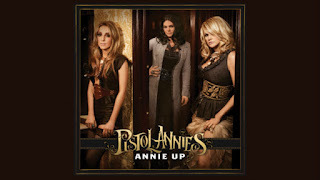 There is no finer young female talent plying their trade in Music City than Miranda Lambert, Ashley Monroe and Angaleena Presley and the fruits of their latest collaboration ANNIE UP is a consummate masterpiece of heritage with a contemporary twist. This is an unashamed attempt to strip back the metaphors and imagery in song writing and produce a string of explicit accounts of everyday issues that have been a central theme of country music over the decades. Each Annie has drawn on their specific and diverse experience of a southern upbringing to cover in no particular order – drink, sin, love, loss, pretense, god, defiance, eternity, sadness and heartbreak. To achieve this in a compact 12 track – 43 minute release, aligned with sassy vocals, expert musicianship and infectious melodies is an extraordinary achievement and pays the ultimate respect to the talents of the three ladies and their supporting cast. Although each Annie is at a different stage of their solo career, the high quality of their song writing is unequivocal and the lyrical content of each track is a major strength of this album. There are definitely concept tendencies to the record as it weaves its way around the issues, unsurprisingly from a female context but cleverly put together to avoid ambiguity. The blues-infused scene setting opener ‘I Feel a Sin Coming On’ gives a hint of what to expect which, after an emotional roller coaster, satisfyingly ends with a delightful uplifting lullaby ‘I Hope You’re the End of My Story’. This finale contains the classic line ‘we’ll be the last book on the shelf’ which perfectly sums up the eternity of love. The album, which in my opinion doesn’t contain a weak track, explodes into life with its first single, the family tension stomper ‘Hush Hush’. The upbeat sound returns later with the catchy rhythmic number ‘Damn Thing’. Many of the songs possess all the hallmarks of those born out of the old style dance halls and honky tonks including the album’s standout track ‘Dear Sobriety’, an interesting take on the obligatory country drinking song. The different facets of a troubled relationship are tackled in ‘Unhappily Married’ and ‘Don’t Talk About Him, Tina’, while the consequences of a breakdown are expertly examined in ‘Trading One Heartbreak for Another’. An intriguing track is ‘Loved by a Working Man’ which while on the surface seems a little clichéd in its male perceptions, perhaps does have a sad undertone to the failings of the other half. This is much in the same way that Tammy Wynette commented that ‘after all he is just a man’. ‘Being Pretty Ain’t Pretty’ is a fairly straightforward questioning of the value of the personal façade but does contain some stellar pedal steel from Steve Fishell, who recently brought his talents to the UK as part of the Emmylou Harris and Rodney Crowell band. Each Annie has a distinctive yet very southern drawl to their vocals and these are shared evenly across the tracks. For example Angaleena leads off ‘Girls Like Us’ before paving the way for Miranda, while Ashley takes the helm at the start of ‘Blues You’re a Buzzkill’. All twelve songs are enhanced by the fine backing musicians assembled and while there are short bursts of electric, the remit is to generally keep it low key and traditional in style. In the true tradition of Kitty Wells, Tammy Wynette and Loretta Lynn, the Pistol Annies have re-created a dose of female oriented pure country music to keep the flame burning of a bygone sound that should be preserved and celebrated by the whole of the genre. So kick your shoes off and treasure the rare talent of these three ladies. ANNIE UP is the real deal and a perfect example of how this style of country music should be made.